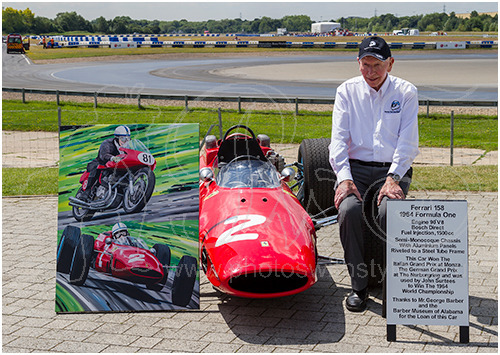 John Surtees OBE with the Ferrari 158 in which he won the 1964 Formula One Driver's World Championship alongside a painting by motorsport artist David Daisy celebrating John's legendary abilities on both two and four wheels. The Ferrari 158 being on loan from the Barber Vintage Motorsports Museum of Birmingham, Alabama, USA and was driven by John at Mercedes-Benz World, Weybridge, England as part of a track demonstration of iconic Surtees cars to raise money for the Henry Surtees Foundation. If you like this picture you may also like my Classic cars gallery.